"HOW DO YOU SAY "CALL 911" IN ITALIAN?" We were visiting our daughter who was going to school in Padua, Italy, about a half hour outside of Venice. We were walking down a one way street near the curb, & I was looking at everything except where I was going. She pulled me onto the sidewalk & yelled, “Watch out!” She said I was almost hit by a cab going against the traffic. I pointed to the one way sign & asked her why a cab would be going the wrong way. She told me the smaller print on the sign (which I couldn’t translate) explained it. It seems it was a one way street--except for cabs & buses. Go ahead, explain the logic in that to me; I’m waiting. Things weren’t much better in Rome. 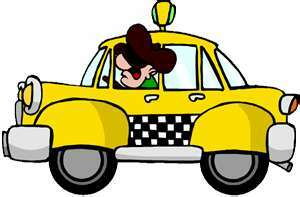 Bud & I were in a taxicab & wondering why, with such wild driving, there were relatively few cars on the road that had dents in them. We figured it was because they all got totaled. Not so. Our cab, while we were in it, got into a fender bender. Our driver asked if we were OK--we were--& then told us to please excuse him but that he would be stepping out of the cab for a few minutes to argue with the stupid son of a female dog that had hit us--&, gentleman that he was, he would be turning off the meter while he was out of the cab! We hire a car & driver (whenever possible) when we’re traveling in a foreign country. That way, we never get lost & we both can enjoy the scenery. It’s an especially good idea if you’re in a country where they drive on the other side of the road. In an emergency situation, we tend to veer right. The other driver would tend to veer left--your right! (Side note: We were in Hawaii for the first time. I know that’s not a foreign country! Bud was driving a rental car & I had a map & we were trying to find a certain street. He asked me to get the name of the next street off the sign as we drove by. The street sign said “Kealakekua”--or something. I told him I wasn’t sure what the street name was, but that it started with a “K”. Not too much help in Hawaii!) Back to the car & driver: We had hired a gentleman to take us somewhere in the countryside outside of Rome. We had a lovely morning & stopped at a hunting lodge for lunch on the way home. The driver was sitting with us & he & I were drinking wine & laughing & drinking wine & eating--& drinking wine! (Bud neither speaks Italian or drinks. Do you think it’s easy to drink for two?) On our way back to Rome, the driver stopped by the side of the road to “use the facilities”. Bud said that was the only time he ever paid a driver to pee in the woods. There are other advantages to hiring a driver--they usually speak English & they know the locals. When we were in Milan we, of course, wanted to see the La Scala Opera House. I think we were there for only a night or two & they were sold out. Our driver said not to worry. He said he knew someone who could help us. We weren’t too interested in the performance; the Los Angeles Symphony was guesting there that week but we wanted to see inside the theater. He drove us there & spoke to someone. Next thing we knew we were seated up high in one of the box seats of La Scala, which was empty except for the two of us & a lone pianist rehearsing onstage. The theater was beautiful & the acoustics were amazing! 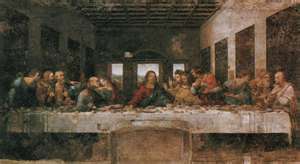 We stayed about a half hour & then he drove us to the Santa Maria delle Grazie church, where we saw Da Vinci’s “The Last Supper”. As I remember, it was a fresco, on an outside wall, in a sort of patio. It was faded, but still beautiful. (I understand it has since been restored & is now in a sealed, climate controlled environment). What a marvelous day!!! We’ll always have Paris: My husband & I were walking--obviously a dangerous thing for me to do in Europe--down a beautiful boulevard in Paris. He suddenly pulled me up against a building. (I seem to get pulled a lot overseas.) This time a cab driver apparently felt the street was too crowded, so he decided to drive on the sidewalk, instead. Silly me, I thought this was strange. Stranger still. I found out later this was not that unusual!! PS—See, I’m back already! I just remembered something. The best time we ever had with a driver was when we went to Gettysburg. The National Park Service hires Civil War buffs (usually retired men) to drive your car (so you won’t be distracted) & guide you on a private tour through the battlefield. He tells you things like, “About 5:30 am, General Winfield Scott saw 200 soldiers coming down that hill…” You can ask him any questions you want. You are not rushed at all. I am definitely not a history buff, but it was fascinating!!! A lot of the things we did you can’t do anymore, but I just Googled it & am happy to report this service is still available! !